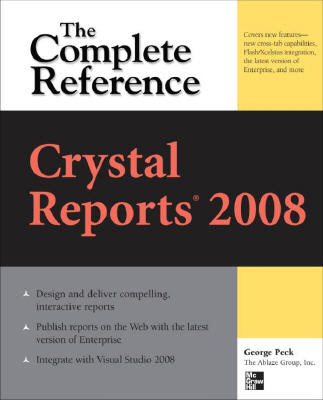 George Peck, "Crystal Reports 2008: The Complete Reference"
Transform disconnected corporate data into compelling, interactive business intelligence using all of the powerful tools available in Crystal Reports 2008. Through detailed explanations, real-world examples, and expert advice, this comprehensive guide shows you how to create, maintain, and distribute dynamic, visually appealing enterprise database reports. Crystal Reports 2008: The Complete Reference explains how to select and gather pertinent business data, organize it into manageable groups, and i it into user-friendly business reports. You will learn how to improve report interactivity with sort controls and the parameter panel; solve complex reporting problems with cross-tabs and subreports; integrate Crystal Xcelsius dashboards; reduce development time; and publish your results to Web and Windows applications.